Michael Knott, managing director of Newport Beach, California-based research firm Green Street, wrote in an e-mail that West Los Angeles is the top office market based on forecasted rent growth growth through 2017. In contrast, he said San Francisco’s office market is now in the “fifth inning” of a nine-inning recovery, with “decelerating” growth that’s dropped its five-year outlook for rent increases to second in the U.S. based on revenue per square foot. Office rent growth in San Francisco has been quite spectacular while office rent growth on the West side of Los Angeles has been slow. San Francisco’s rent growth has produced a development wave that is the greatest since 1991, while the West side Los Angeles office growth consists of a few warehouse conversions. You can read the full article below. San Francisco Leasing Slows Amid Office Boom: Real Estate – Bloomberg. A recent article in the San Francisco Business Journal announces the successful conversion and lease up of a marble clad mid rise to creative office. 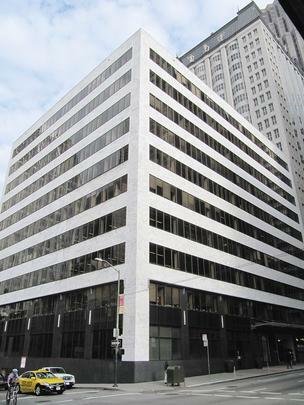 Hot tech firms take space at renovated 550 Kearny – San Francisco Business Times. Why did the owners of this building convert and market itself as creative office? Because that is the space that is leasing and selling. As many parts of the economy grow slowly and even shrink–new media and technology continues to grow. New media and technology desire creative office. In many cities–office owners and architects are spending hours at the drawing board trying to figure out how to position their properties as creative office. 550 Kearny was neither in the best area for tech or was the best building for a conversion. It was, though, a poured in place concrete building with decent ceiling height. But most important–it was in the middle of a city going through another technology industry boom. These buildings are known as soft creative: conventional offices converted to creative by exposing their natural structural elements. Typically, creative office buildings are converted warehouses that have the ceiling height, windows, and structural elements of more traditional creative office. Creative office is one of few office products with a growing demand, and all owners want on to this life boat. However, eventually, the number of conversions could capsize the boat. After the dot com bust, owners converted many of these soft conversion back into traditional office space (at $50 to $60 a turn–ouch!). Growth of west side start-ups engaged in producing video content for the web, is fueling absorption of office space, housing, and retail. Numerous video web content companies have sprouted from Silicon Beach to Hollywood, through Playa Vista and Culver City. The successful monetization of this industry will determine whether this burgeoning field continues to grow. So far, You Tube has experienced some initial success of selling ads on its You Tube channel. Now it starts experimenting with charging for premium channels. For those in Westside Real Estate–let’s keep our fingers crossed. You can read more about this below. YouTube begins paid subscription pilot | Internet & Media – CNET News. This article from the Wall Street Journal reports on the shift of bright graduates leaving for or opting out Wall Street finance and hedge funds jobs for jobs at technology start ups. Late Shift: Foosball Over Finance – WSJ.com. This shift also explains the shifting fortunes in the real estate industry. Certain cities which are attracting technology companies are doing well while others are doing poorly. In San Francisco, rents in the City’s financial center, the North Financial District, are starting to lag those in the City’s tech center, the South of Market District (SOMA). The article reports that New York has successful offset job losses in finance with job gains in technology. Office brokers continue to report demand from technology start ups and continued downsizing from banks, major corporate users, and service firms. The shift is translating into where the movers and shakers want to live. Perhaps, this shift from financial engineering to social and enterprise engineering will result in increased productivity and in the end a bigger pie for everyone. This monetization for an emerging original-video-content-for-the-web start up is a shot in the arm that the Westside office market needs. New start-up original content companies have spurred growth of employment and office absorption on the West-side of Los Angeles. Now DreamWorks is paying $33 million to buy one of these start-ups. This investment shows that the big boys now think this movement is real. This trend may result in additional funding for these start-ups, more start-ups, and more West-side creative office absorption. Anecdotal reports of success have come from other ventures, including You Tube’s new studios in Playa Vista. A review of Crunchbase shows about $3.5 million of venture investment in Awesmeness TV, so there is probably some pay day in the $33 million for the founders and their investors. Read about the acquisition below. DreamWorks Animation Agrees To Pay $33M+ For AwesomenessTV – Deadline.com.